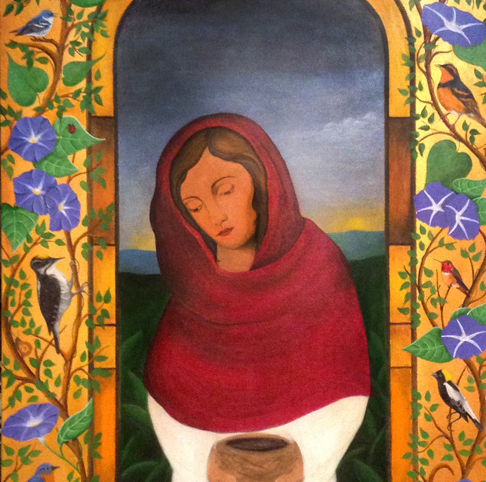 Last month, I shared a sneak peek of the “Prayer for the Birds” from the “Where I Stand is Holy” series (4 panels inspired by illuminated manuscripts that address species extinction related to climate change and other human factors) and mentioned that I had been stalled on this painting due to some resistance. And in reflection, my resistance was about fear and attachment instead of trusting and being in the process. I’ve never had this type of technical problem with my painting but since my Iconography class two years ago, I have been attempting to integrate similar layering techniques into my work. After adding too many layers of paint in the center window, I was struggling with getting the paint to lay down in the sky and on the figure. I was also attached to the way the face was looking even though I could tell it wasn’t quite right. Intuitively, I knew I would have to start over but resisted that until I finally surrendered. Fear crept in along with my perfectionism. Ego was driving the process not divine trust. Ultimately, I had to let go and leap. So, I sanded down the face of the madonna and did start over. I reworked the morning sky. At any given moment during the painting process, when fear or perfectionism shows up, it helps me to repeat a mantra to myself asking Spirit for guidance knowing that I am simply the vessel giving expression to this sacred art. A holy prayer that this beauty may serve others and our world. In his book, “The War of Art,” Steven Pressfield speaks to the many layers of resistance and that is a natural part of the creative process. The key is to acknowledge it and continue to show up every day to do the work (whatever that is for you) we are here to do. What is yours?